Names: Nicolaos of Myra, Hagios Nikolaos, Sanctus Nicolaus, Nikolaos ho Thaumarturgos (Nicolaus the Wonderworker). Tagline: Born in the Roman province of Asia Minor, Nicolaus was made bishop at a young age. He took part in the Council of Nicaea, which set down many of the foundations of the Christian church, and received a rumor as a miracle worker. Claim to fame: Look, he’s the guy who became Santa Claus, alright? Today is the feast of Saint Nicolaus, marking the anniversary of his death back in 343. Everybody knows Santa Claus as the jolly, white-bearded Father Christmas figure that was solidified some time around the beginning of the 20th century. But I’d like to take a look at the original story of Saint Nicolaus, Bishop of Myra. Nikolaos was born in 270 in the city Patara, in modern day Turkey. His parents died in an epidemic while he was child, and he was raised by his uncle – Nikolaos, bishop of Patara. For a while, he lived in a monastery in the Holy Land, visiting all the holy sites. Then, after his return in 317, he became the bishop of Myra, and was bishop there until his death in 343. This allowed him to participate in the First Council of Nicaea in 325, a meeting which was called by the Christian emperor, Constantine, to streamline what was considered Christian dogma. So far the general biography. But as with all saints, colourful stories abound about Nikolaos. Some tell of charity and his general virtue, others of miracles connected with him. For instance, when he was on board a ship to take him to the Holy Land, a terrible storm blew up, and one of the sailors was thrown from the mast, and killed upon impact with the deck. The sailors begged Nikolaos to pray for them to get safely through the storm – and as he prayed, the storm abated. Then, when he prayed for the dead man, he came back to life. Which is probably what makes him patron saint of sailors. According to tradition, he went to jail twice. The first time was during the persecutions of the emperor Diocletian, who wanted to stamp out the Christian heresy, and return to the old gods of Rome. Nikolaos was taken as the leader of Christians in his city, tortured and imprisoned. The second imprisonment was during the Council of Nicaea. A major point on the agenda was a discussion of Aryanism, which stipulated that Christ was created, and maintained that God was above the son. According to legend, at one point, Nikolaos was so angry that he walked across the floor and struck Arius, the founder of Aryanism*. This caused him to be stripped of his bishopric and cast into jail. But the next morning, he was found in his cell, wearing his bishop’s robes and reading scriptures. When it was determined that nobody could have visited him in the cell, he was reinstated as bishop. Another story sounds like a precursor for Sweeney Todd. During a famine, a butcher killed three boys in order to cure them as hams. In a different version, the butcher killed three clerks who wanted lodgings for the night, so that he might turn them into pies. But when Nikolaos laid eyes on the butcher, he immediately saw his crime, and when he prayed over the slain boys/clerks, they came back to life. One story in particular laid the groundwork for Saint Nicholas’ transformation into Santa Claus. A poor man in his city had three daughters. But the man did not have money for dowries for them. This would make it likely that they would be unable to marry, forcing them to live as prostitutes. But the man was proud, and did not want to accept charity (or, in another version, Nikolaos didn’t want to be known as the giver). And so, Nikolaos threw a bag of money through the window on the night before the eldest girl came of age, to pay for her dowry. The next year, he did the same for the second girl. 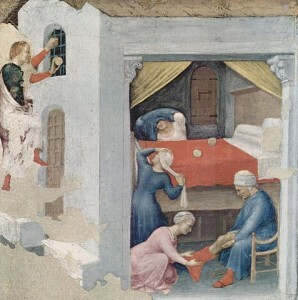 An old Italian illustration of the story of the dowry for the three virgins. But the third year, the man laid in wait, to find out who was giving them this money. Nikolaos discovered this, and he climbed on to the roof of the house, and dropped the money down the chimney. That day, the girl had washed her socks and hung them to dry by the fire, and the money landed in one of her socks. Thus was started the tradition of hanging socks by the fire for gifts from Saint Nick. Nikolaos has become a popular saint. He is the patron saint of sailors, children, merchants, brewers, repentant thieves, broadcasters (apparently), and a number of other things, including a long range of cities. And I think it’s easy to see why. Unlike some very austere, grim and bloody saints, Nikolaos seems personable, charitable, approachable, and very human. How to use him: Nikolaos has the makings of an interesting holy figure. I could imagine using him for inspiration for a life story for a priest or similar figure in a fantasy setting. Or for that matter, for a god if you’re making a polytheistic setting. But more than that, I think it would be interesting to use him more as a counterpoint to the very materialistic model of Santa that has developed recently. Saint Nicholas is a figure that helps people in need and protects the weak. Another interesting point about Nicholas: Apparently it caused some controversy recently when Mall of America had a black man as their Santa. Well, it turns out that Nikolaos is very unlikely to have been the very pale “Aryan” (pun intended) figure we usually associate with Father Christmas. He seems to have been a local of what is today Turkey (though I guess it’s difficult to say exactly how people around there would have looked back then, what with migrations going back and forth across that territory in the millennium and a half since then). *: This story is, unfortunately, most likely entirely false. First of all, it seems far from certain that Nikolaos was at the Council. But more than that, it is highly unlikely that Arius was there, since he was not a bishop. The whole mess started because Arius was arguing with his bishop.